April is a busy month for our Valley of San Jose, and specifically for the Chapter of Knights Rose Croix. The Chapter will be hosting the April 8th Stated Meeting. We will also go through most of our Degrees for the Spring Reunion and will be conferring the 18th Degree on Saturday, April 12th. We hope many of you will be there. Our Maundy Thursday ceremony on April 17th begins at 6:30pm and is open to the public. We are looking forward to seeing many of you, your friends and family and Brethren of your lodges at this solemn ceremony. 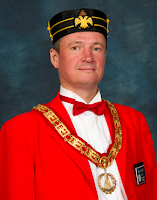 It is a great way to show them what Masonry is about—the Scottish Rite in particular—and the ceremony’s rich symbolism is an impressive source of inspiration. Like other old ceremonies of nature’s renewal around the time of the Spring Equinox, it is a new start for us, our thoughts, our souls, and, with some refreshments served, our bodies. We think about the hardships and losses through those tough winter times, and look forward to a great new year again! Last but not least, On Saturday, April 19th, we will have the first of a series of casual wine tastings. We will meet at 1:00pm in the Stevens Creek Reservoir parking lot to consolidate cars. One of the wineries that we will be visiting has very little parking space, so we will try to accommodate them. Hopefully you had a chance to get a Santa Cruz Mountains ’Passport’ via the website (www.scmwa.com). You will need that ’Passport’ to get into the wineries. If you have not yet made reservations with me or have any questions, please call me at (408) 505-1822. We do have a few spots left. If you cannot make it this time, I hopefully will see you in July for our next event!